Everyone knows that a woman is the most beautiful she’ll ever be on her wedding day. She’s in love, and happy and excited about the wonderful day she’s about to have, and, if you did your job and insisted that she has a wedding planner, she’s stress free. The Bridal portrait is one of those shots that’s just as important as the First Kiss as a Married Couple…get it or get prepared to have a very upset bride. The first question that I get asked at any of my wedding seminars is whether to shoot the Bridal Portrait with the bride looking at the camera or not. I think it’s really important to shoot both. There are a lot of emotions going on the day of the wedding. They laugh, they cry, they lament the fact that they’ll never kiss another guy ever again, freak out when little things go wrong (and trust me…in 20 years, I have never been at a wedding where something hasn’t gone wrong). 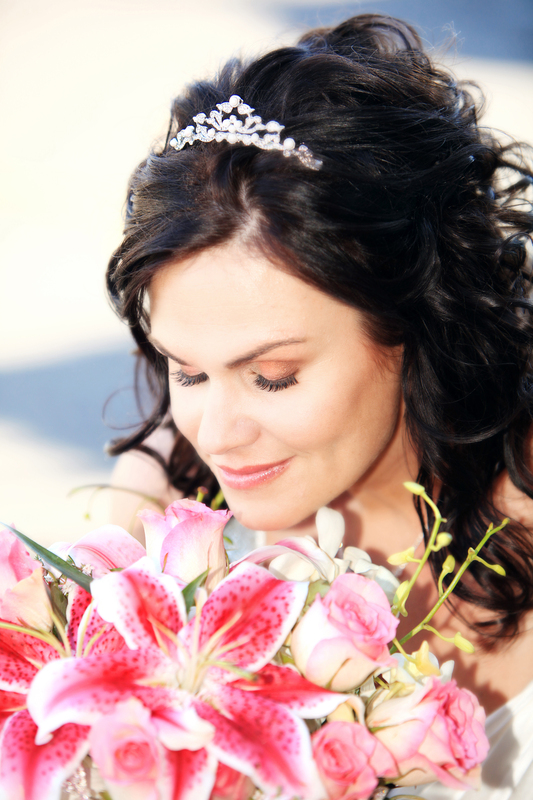 I had a bride who threw up…things happen. So be there for all of it. Film’s cheap…in fact, film isn’t even film any more. There are no developing costs, so shoot heavily. Except for the throwing up part. Don’t shoot that. That’s gross. I always find that in between the shots, when the bride thinks you aren’t shooting, make for the best actual “keeper” shots. They aren’t feeling pressured to force an expression. So I usually say something to make them feel like they are on break, like “that was great”, and then keep shooting. 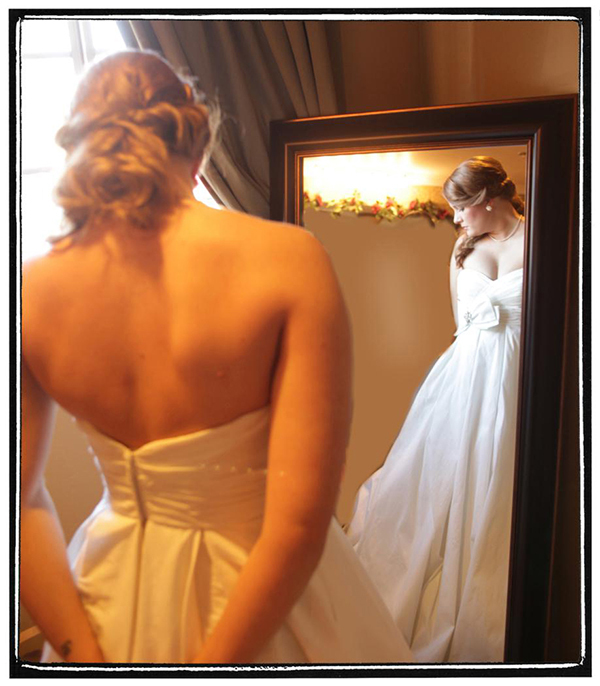 Erin was a breathtaking bride, getting dressed in a very dark room, so to avoid harsh flash shadows, we moved the full length mirror near the window for natural light, and put her under the overhead central tungsten light so that it could light her back. I asked her to wait until I told her to look at herself, and then shot while she was waiting . I am a photographer who styles my shoots while I’m shooting. So most of my pictures look candid, but I’m talking my clients through the shot the whole time. Not everyone will do what I tell them to do in the manner that I intend it, so I always get happy surprises that are planned, but at weddings, the emotions are so high that you never know what is going to happen, so it’s extremely important to stay ready. This shot of Erin was immediately after her wedding planner told her that it was time to go to the ceremony. She looked down and took a deep breath in, and I just shot it. There are times when I’m shooting that I get overwhelming feelings that I just can’t ignore about things. When I was shooting the Beautiful Heather’s wedding, I kept thinking that she reminded me of a kind of Pre-Raphaelean Cleopatra, and when we came upon this location, I just had her lay down. She said, “Ooh, like Cleopatra? !” I was so wowed!! This was her favorite shot. Bring energy bars, Wear comfortable shoes and prepare for all kinds of weather, no matter what the forecast says. You have to feel as good as possible when you’re shooting a wedding. Otherwise, you will miss important moments. Send me your wedding portrait wins and fails to Barb@barbstitzer.com and you and I can talk about them. Let’s get better together!